We finally lived a month really focusing on controlling all of our spending and, Wow! We spent only $2893.59 which is $1,000 less than the best month we have had to date. We reduced spending in almost every category. For details on how we did it please see below. 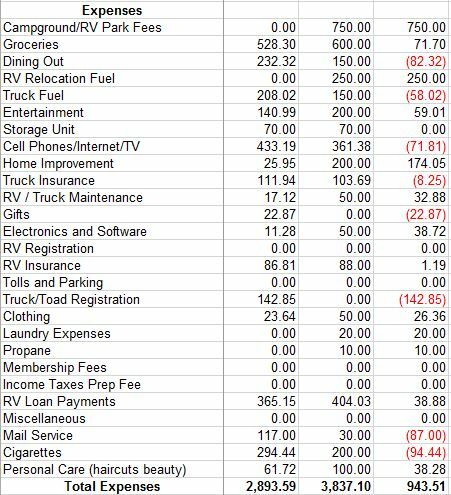 Campground Fees – We are volunteer work kamping so no fees this month. We have a beautiful site and there is minimal work that needs done in the off season so it has been more than a fair bargain. Groceries – We have struggled in this category but this month we put a new plan in place. (I would just like to point out that in the entire month, I didn’t buy a single pie. Clearly the overage is due to Tracy’s reckless purchasing of salad components. She’s the Ron Swanson of salad.-Lee) We have regular meal plans and have eliminated waste down to the minimum. Towards the end of the month we did struggle. Meat continues to be a problem as we don’t have a large freezer and are somewhat at the mercy of that week’s prices. What we are doing now is buying whatever meat is on sale and menu planning around it which takes some creativity on my part. We also just ate whatever was in the cupboards the last couple of days to avoid making a store run until the first of the month. I am in no way prepared to declare victory in this category, but it’s a huge step forward. Dining Out – We went over because we celebrated my last day of work. We could have skipped those meals but in my mind certain things deserve a celebration. Entertainment – Very happy with this category because we managed to do several things this month, yet didn’t spend a lot on them. Cell Phones /Internet – This category has a new baseline with the minimum Verizon phone plan we bought. Since that will now be my work phone this may actually go up, but for now we are holding the line. This includes 80GB data (and we use every bit of it, every month), an AT&T phone, a Verizon phone with 1GB of data (mainly use the AT&T wireless), and an AT&T Ipad. So there we are. In order to prove this is not an anomaly we need to see what happens over the next few months. It does prove it can be done though, at least short term, which is very comforting. This entry was posted in Uncategorized and tagged Full timing budget. Bookmark the permalink. We were also under budget this month, even though Bill did quite a bit of maintenance on the rig! Not having CG fees and not taking the truck out certainly helps a lot! We were slightly over on food, but way under on eating-out and entertainment. This workamping thing is working out pretty well! Yay to both of us! Awesome work on the budget, we continue to struggle with the budget roller coaster but the highs and lows are starting to even out. Once again I want to thank you for the gold mine of the budget information. My jump-off is getting closer by the day and having some sort of idea of what my budget is going to be is crucial. Hope to meet you guys someday! I am loving reading your blog. I did have a question about changing to Florida resident if you do not mind. What mail service do you use? Why did you pick them over others? I have been reading a lot about different mail service etc and it does get confusing. Can the process to become a Florida resident be done in just a matter of a few days? Thank you so much for any information you can give me on any of this. Thanks for the great blog as well. Thanks Chris. We chose st Brendan’s isle and are VERY happy with them. Escapees uses a Texas mailing address and forwards from Florida and we just weren’t comfortable with that. It can be done I. A few days if you have your vehicle titles. If you are in one of those states where the bank holds the title and it had to be sent it can take 2-3 weeks. Only a few states are like that though so check and make sure you have your titles before you go. Thank you so much for the reply. I assume St Brendan’s give you an address to use as well? We had also looked into using the Good Sam one. I had not heard about this one until I read your blog. Thanks again. I still have a lot of reading to do on your blogs but I am really enjoying everything so far. I started out reading Kelly’s and I am all caught up on her blogs so now I reading all yours whenever I have a few minutes or a few hours LOL It is hard to stop reading once I start. Thanks !!! Appreciate the kind words. They gave us a site number along with their main address. Usually works fine although occasionally someone won’t take he site address. They are a small operation so I feel completely confident I will get my mail and they have an online scanning feature that I like as well.